Whenever you are moving to a distant location, there is a problem of moving your car there. 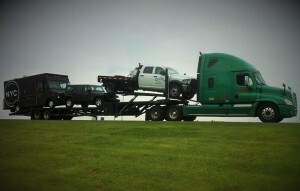 If you don’t want to risk and drive your car across the country, you are probably considering Car Transport services. Auto transport is quite popular today. It is a simple way to deliver a vehicle from point A to point B. It is usually also cheaper than driving a vehicle for a great distance. Auto shipping is used not just by businesses and car dealers, but by common people as well. So if you’re considering moving your car using an auto transport company’s services, just look for dependable car carriers and your car will be shipped easily and securely. Denver Car Shipping is a highly trained team that can help you move your vehicle to any place in the United States. If you are looking for a reliable crew that can ship your car securely and in a timely fashion, our Denver Auto Transport company is the right choice for you! We will pick up your car right from your place and one of our big rigs will ship it door-to-door. We offer two methods of Denver Car Transport. You can choose between Open Auto Transport and Enclosed Auto Shipping. Open Auto Transport is the most common way to ship a car. Vehicles are shipped in an open trailer and exposed to weather conditions. This method is absolutely safe and it is also cheaper than Enclosed Car Transport. But if you are looking to ship an exotic or classic car, we recommend using Enclosed Car Shipping. This method of Denver Vehicle Shipping is the most secure because an enclosed trailer is used to ship a car. It protects the vehicle from the weather and road dirt. Whichever method you prefer, Denver Car Shipping will be happy to ship your car safely and promptly. Get a free quote from us today!